Everyone who often does work on the construction site must be very clear. How important time is for concrete. If the delivery vehicle is moved from the mixing station, if the transportation time is too long, it will affect the concrete slump. Less than the required standards for construction. Today, we will introduce you to a good machine. 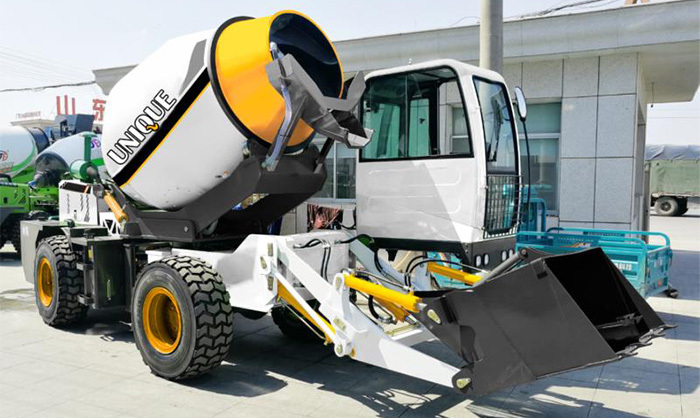 Unique’s self-loading mixer truck is now a domestically advanced mixer truck that can minimize the adverse effects of time on concrete and can be used at any time. It is completely possible to save the process of mixing stations. Unique self-loading mixer combines multiple functions for integration. One car can complete the production, mixing and transportation of concrete. The body comes with an electronic scale, and the specific value can be clearly seen in the cab. Adjusting the ratio, adding water is not difficult, because it has a large-capacity water tank, the car body is equipped with Yuchai engine, many terrain can easily deal with. The traditional self-propelled mixer truck can only be used for mixing, and the fully automatic mixer truck manufactured by Unique can not only achieve 270 degree lateral rotation, but also can discharge at any direction of the body. This self-loading mixer works. At that time, only two workers are required to operate easily, and the workers do not need to use too much effort. They only need the operating procedures plus some auxiliary operations. Since this car can be automatically loaded, it can greatly improve the output value and efficiency. It can produce 140 square meters of concrete per day, and the daily gross profit is about 2,000 USD. This is a good helper to save time and effort. Really ready to use at any time, no need to stir the station anymore.